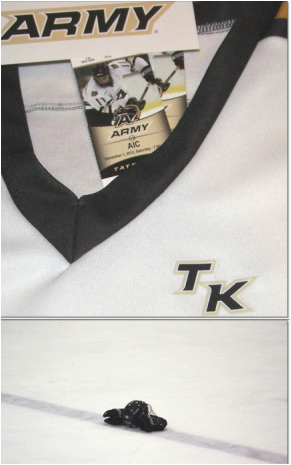 On December 1st, 2012 Army Hockey honored Major Tom Kennedy, a former player, hockey team officer representative, and 2000 graduate of the USMA. Major Kennedy was killed in action in Afghanistan in August of 2012. He was a true american hero. His initials, TK, are on two locations on the ice along with an american flag. Ceremonies were held prior to, and after the game with AIC at a sold out Tate Rink at West Point. Major Kennedy's family was in attendance for the ceremonies. At the end of the game, the Army alma mater was played as a pair of gloves and a helmet were placed on the blue line in Major Kennedy's honor. Army's jerseys all bore Kennedy's name. Below are photos of the evening's cermony and game, which Army won, 3-2.